Overwintering coleus is easy, and it’s a great way to keep your favorite varieties year after year. In this post, I’ll show you how to keep coleus over the winter, and give you tons of coleus care tips too. Coleus plants are one of the most colorful plants you can grow in the garden, and they add a wonderful tropical feel. They come in all kinds of color combinations too. One of the things I love the most about them is that they add tons of color to shady gardens and planters. Once you know how to grow coleus in winter, you can keep that beautiful color year after year! 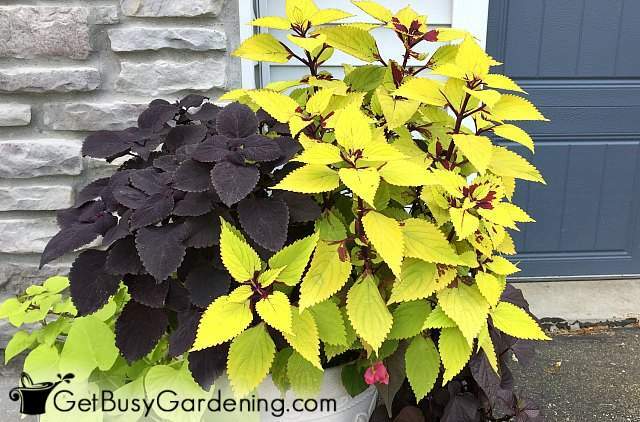 Are Coleus Plants Annuals Or Perennials? Even though you’re likely to find coleus plants for sale as annuals in most areas of the country, it’s actually a tender perennial that can survive for many years in the right climate. Coleus temperature tolerance isn’t very high, and they can’t handle the cold (coleus cold hardiness is zone 10 or warmer). The plants will start to die at the first touch of frost in the fall. But don’t worry, overwintering coleus indoors is pretty easy, and there are a few ways you can do it. That means you can grow your favorite coleus plant varieties year after year without spending a dime buying new plants each spring. Potted coleus plants can be brought indoors and grown as a houseplant. You can take cuttings from your plants, and root them for growing indoors. Below I will describe both of these methods in detail. If you’ve never tried overwintering coleus before, I encourage you to experiment with both methods and see which one works best for you. Then after that, I will give you tips for how to take care of a coleus plant indoors in winter. If you’re growing coleus in pots, you could overwinter them as houseplants by bringing the whole container inside for the winter. If your potted coleus has grown huge over the summer, you can trim it back so it’s a more manageable size for growing indoors (be sure to keep the cuttings so you can try the second method too!). Keep in mind that your coleus plant is used to growing outside all summer. So, the plant may droop or even drop a few leaves after bringing them indoors. That’s completely normal behavior, and it should pop back in a few days. Rather than overwintering coleus plants in containers, sometimes it’s less work to take cuttings instead. 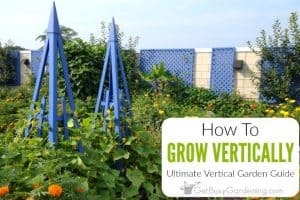 This is also a great way to keep the varieties you grew in the garden. Coleus root in water, and can be potted up and grown as a houseplant too. It’s best to take coleus cuttings before it starts to get cold outside, and you’ll definitely need to do it before frost damages the plant. Once they start to die back from the cold, the cuttings may not take root. However you decide to try overwintering coleus, it’s important to debug them before bringing them indoors. If you plan to bring the whole plant inside, then follow these instructions for debugging potted plants. You can debug your cuttings using the same method, or you can do it on a smaller scale inside. 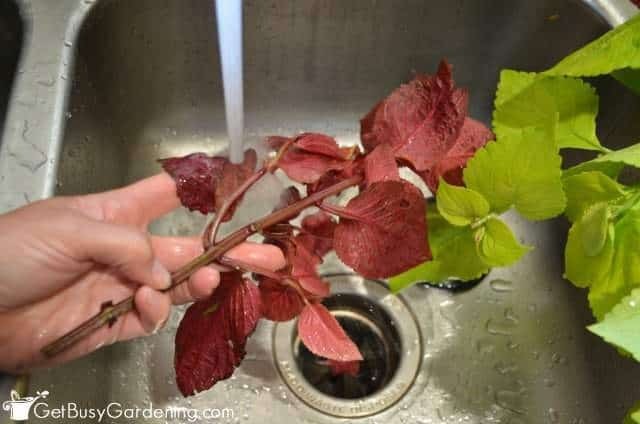 Soaking the cuttings in the sink for about 10 minutes will drown any pests insect that are on the leaves. 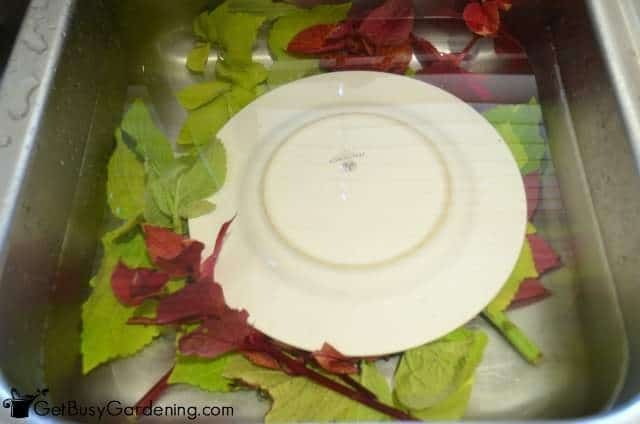 Be sure to weigh the cuttings down so they won’t float (I used a dinner plate). You can add a squirt of mild liquid soap to the water to help kill pest insects. After they are done soaking, rinse the leaves with plain water to remove any bugs, dirt and soap. 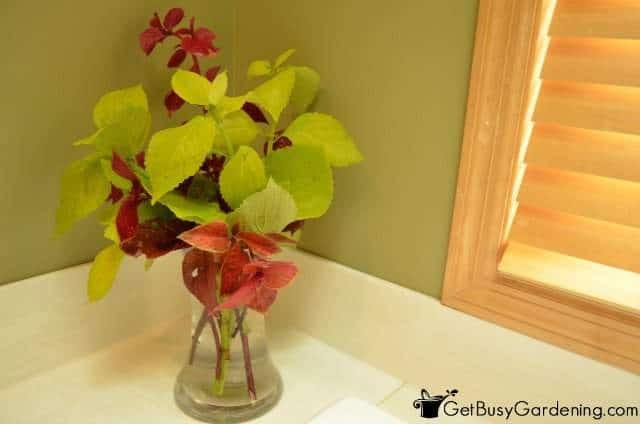 Once you’re done, simply place the cuttings into a vase of water to root them. When the cuttings have grown some nice healthy roots, then you can pot them up into a container. You don’t need to buy any special soil for transplanting coleus cuttings, you can just use a general purpose potting soil to pot them up. Though they prefer the shade outside, coleus plants will grow their best indoors with lots of light. Place the pot in a sunny window where it will get plenty of bright, indirect sunlight. If you don’t have much natural light in your home, then you can add a grow light to keep them from getting leggy and reaching for the light. Plug it into an outlet timer to give your plant plenty of light even when you’re not home. Keep the soil evenly moist through the winter, but never soggy. Allow the soil to dry out a bit on top before watering your plant again. To avoid overwatering, stick your finger one inch into the soil to make sure it’s not wet. If you struggle with watering houseplants, then you can get yourself an inexpensive soil moisture gauge to help you get it perfect every time. 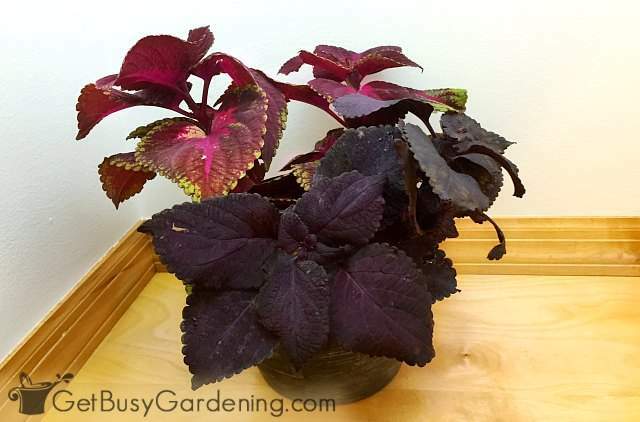 One of the biggest challenges of overwintering coleus indoors is controlling houseplant pests. In my experience, coleus are very prone to being infested by pests like aphids and spider mites. Potted plants can also have issues with fungus gnats (they don’t eat the leaves though). Be sure to check your plants regularly for signs of infestation. To help control any bugs that might show up, you could spray your coleus with a neem oil solution. Neem oil is an organic product that makes it much easier to get rid of bugs on houseplants, and can even prevent infestations. Read more about how to use neem oil insecticide here. You could also use a solution of soapy water and spray it on the leaves of the infested houseplant (I use 1 tsp of mild liquid soap per 1 liter of water). If you don’t want to make your own, you can buy organic insecticidal soap instead. If your plant is small enough, bring it to the sink or shower and wash the leaves with this soap and water solution. Keep in mind that sprays can damage plants. So it’s best to test any type of spray on a few leaves before treating the entire plant. If you like the idea of rooting cuttings in water to create new plants, then you will love my Plant Propagation eBook. 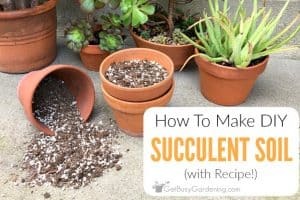 It will teach all of the techniques you need to get started propagating all of your favorite plants right away! Download your copy today. 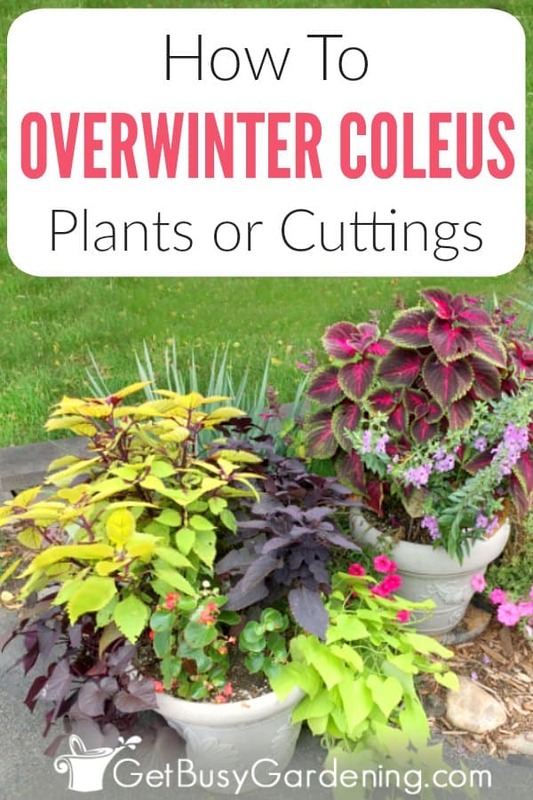 Share your tips for overwintering coleus plants or cuttings in the comments below. Hey Amy! I haven’t been by in a while, was a fun growing season in Minnesota this year! Many of the bulbs and tubers you sent me from that contest I won a couple years ago did fabulous this year. Love this post- taking cuttings and rooting them is an essential gardening task for those of us way up north. It adds color to our houses since for 4 months of the year everything is so WHITE, and it saves trouble in the early spring with seed starting. I know for me, the more space I can save on the seedling heat mats (which I use a lot!) the better. 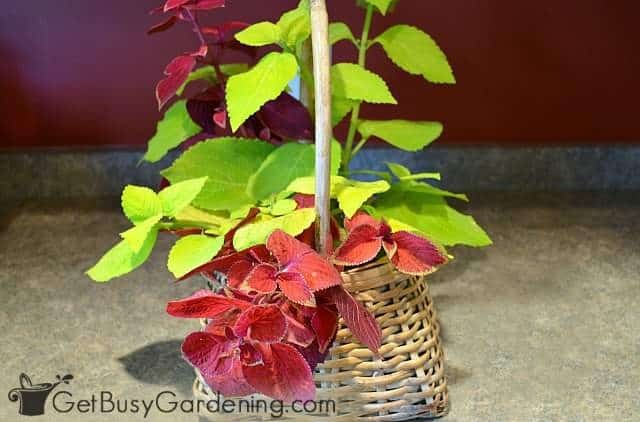 Coleus is one awesome plant to take cuttings from and save. Hypoestes and impatiens always come inside as cuttings here. I also like to grab up cuttings of peppers, and cherry tomatoes as I have good luck getting them to continue fruiting over the winter. This year I tried growing sweet potatoes, and I decided to try cutting up the vines and rooting those- which are working really well! I have lots of bulbs for forcing this winter. I’ll be referring to your post on that when the time comes! Thanks again Amy! Oh that’s great to hear Anna, thanks for the followup on the bulbs – how fun! 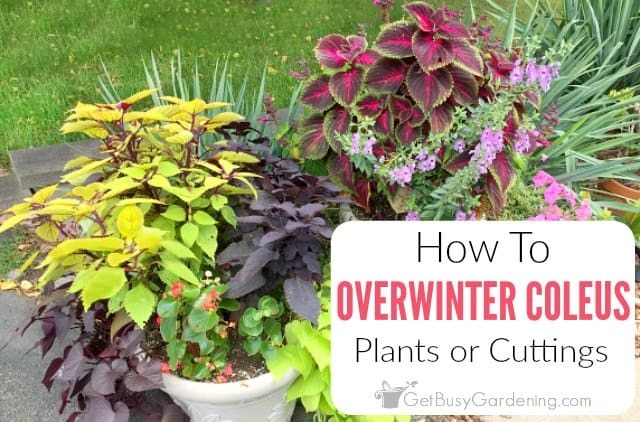 Sounds like you are one busy lady when it comes to overwintering plants! Great article! Coleus is definitely not an area of my expertise. Thank you! Yo. I’ve overwintered them before, and I would definitely say that one needs to wait for a good mass of roots before putting in soil. I haven’t had any problems with pests, but with a rot that destroyed the plant from the ground up. I’ll try overwintering coleus in just water this year and see what happens. Awesome, thanks for sharing your experience with growing your coleus. They can be a bit finicky sometimes for sure. Hi, Stasher — I had the same problem with coleus I was propagating from cuttings. They were rooted in water and the potted-up. The roots seem to rot but also the stem right at ground level rotted as well. I determined that it was a fungal rot call Rhizoctonia. I work in a research facility so we are treating them with 3 different fungicidal treatments. The study isn’t complete but I think pre-treating the cuttings with a fungicide would have been the best solution. 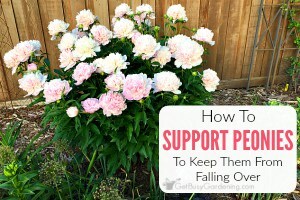 Could you just pull up the whole plant and replant in a pot to take indoors? I have a few in my yard right now that I would love to try and save through the Winter. Yes, you certainly could try digging up your coleus plant and potting it up to bring indoors for winter. But the plant will definitely go into shock from being transplanted and then brought indoors. It will probably droop for a few days, but should pop back once it gets used to its new environment. They’re pretty tough plants. Good luck! Amy, are coleus safe to have around house cats? Just wondering if I need to keep the plants away from curious cats in case the plants are poisonous. I love the variety of coleus colors and textures, and overwintering would cut down on purchasing new plants every year. Thanks!